Ever have those days where you seriously want to knit but absolutely just can’t? There’s no real reason you can’t but every time you sit in your favourite comfy chair and pick up something you’ve been working on for a while and seriously look at it, the question forms in your mind… why am I doing this? Yeah, THOSE days! Well, I’m having way too many of those right now. I’ve been working on Ethan’s slippers; then, while the kids were here last week (for the week), I noticed that he hasn’t been at all bothered by the coolness of the floors, even first thing in the morning. There was only one morning that he asked me to help him put his socks on. Trinity? Well, her feet were chilly but she found a pair of knitted slippers in a basket, put those on and was quite comfortable. Why am I bothering to make felted slippers for them? Then, when Ethan came inside after playing in the snow, I realized how painfully pathetic his Dollar Store gloves were for playing in the white stuff, I started a pair of woolen mittens for him. After a day or two, I discovered his ski-type mittens in his back pack. Why didn’t I know they were there? He really doesn’t need another pair of mittens. I found a really cute pattern for a reading rest for my new tablet (did I tell you I’d bought myself a tablet?? ), started it, then found a pin on Pinterest for a fantastically simple tablet stand. It involves a metal book end (I just happened to have an extra one) and two binder clips, which I also just happened to have (well, I have one but it still works). Why bother knitting one when this one works just as well, put together in a fraction of the time? It’s become a little frustrating, truth be told. I want to knit. I really do. 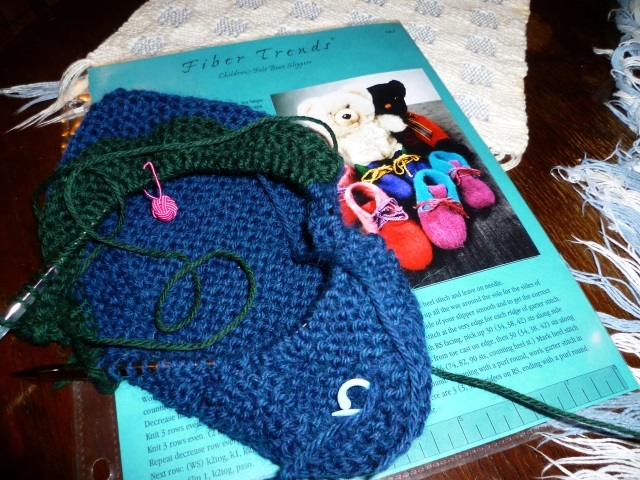 Unfortunately, this week I’ve spent more time frogging than knitting. I think I’ll go cook something instead. 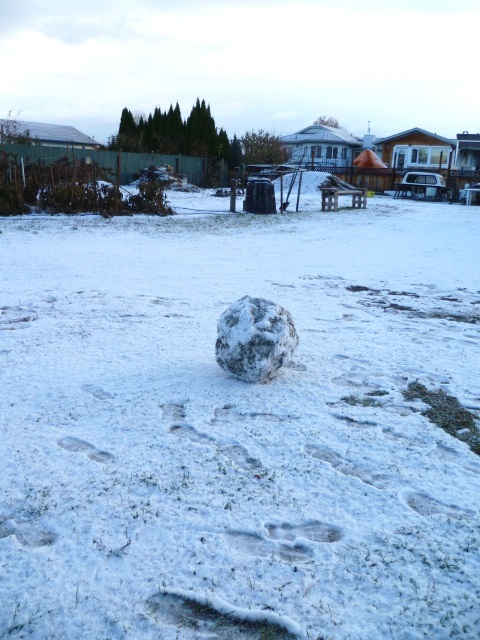 Last week’s snowfall is now a memory. It was one for the record books; the last time this school district had a snow day was 40 years ago, when they closed the schools for one day. 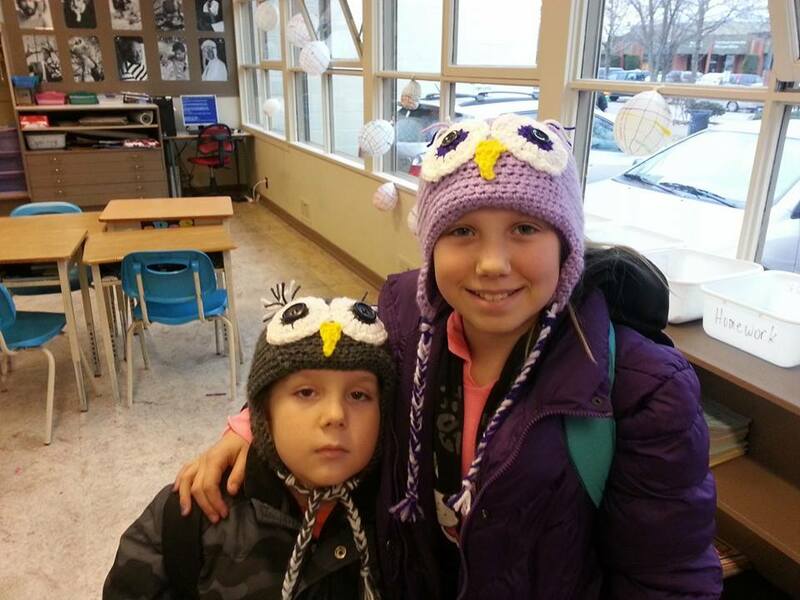 Last week’s snow resulted in two snow days for our school district! 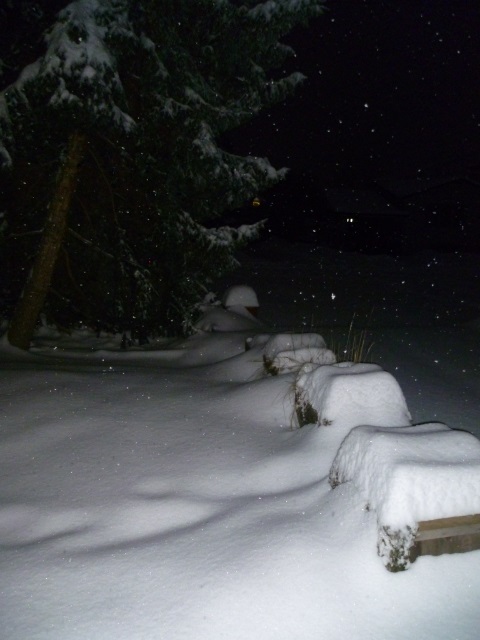 We also broke a long standing record for the most snowfall in a 24-hour period, one that had been standing since some time in the 1890’s, apparently. 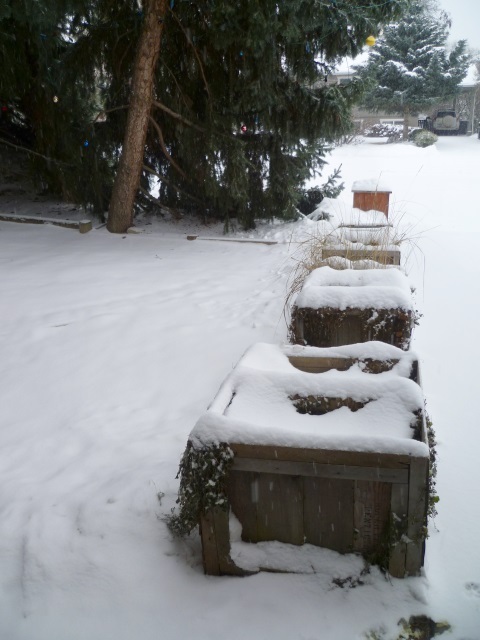 The following three pictures were taken within a 24-hour period. 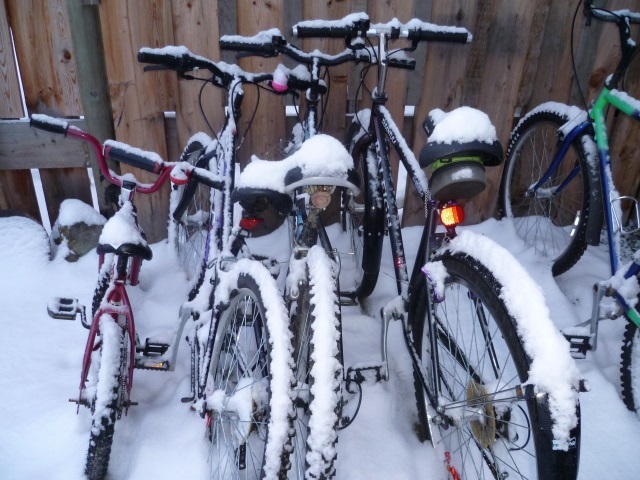 And, for those of you who live in areas where you get a LOT more snow than we get? I know this doesn’t look like a lot; it really isn’t. 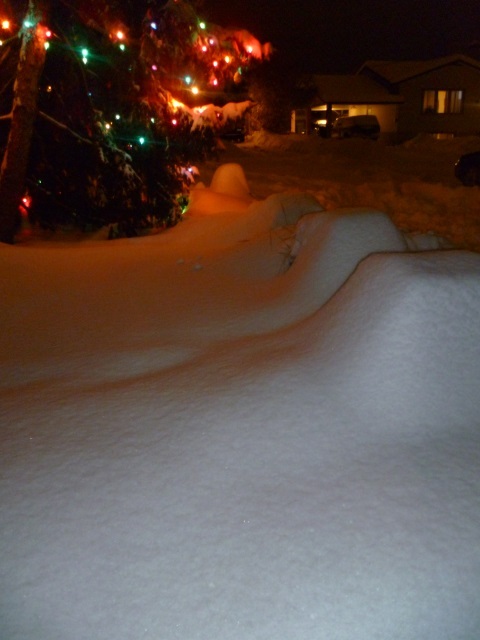 We don’t really get a lot of snow here. Up in the mountains, yes, we do; but down here at lake level, we do get some but not like you get in the prairies or out east. You have my sympathy. I do have other things to talk about, including knitting. Where do I start? Well, after buying my Samsung tablet last weekend, I knew I needed to buy a cover for it. I looked at the covers in Future Shop, London Drugs, and various other locations but was appalled when I found out the prices. I cannot see paying about $45 for a cover so I went online. I found one at Amazon for less than half the cost of what I saw in the shops. Even with the shipping and taxes, it was less than the pre-tax price of the covers I could find locally. And it’s red. I love red. I’m also waiting for a set of screen covers to arrive, probably next week. Incidentally, since I got the tablet, I’ve read two murder mysteries and am well into the third. I haven’t read this much in….. well, I don’t know how long. It’s no wonder I’m not getting much knitting done! One of my sisters turned me on to BookBub and I’ve been downloading some of the free books available there. As well, I’ve finally figured out how to download books from the library to the tablet. Right now, I’m reading “The Camel Club” by David Baldacci. There has been some knitting, too. I finished a pair of fish lips kiss socks for myself. They look rather Christmas-y; that wasn’t necessarily the intention. I found a partial ball of red DK weight yarn, enough to make one sock, or the foot portion of two socks. Then, I came across a ball of white DK weight acrylic and decided to use the white for the heels. I could have used white for the cuffs, too, but it’s acrylic… not the nicest acrylic I’ve ever worked with. It even squeaked on the needles! I went back to my stash and found two balls of green DK, the same brand as the red. Both the red and the green have wool, possibly even 100% wool. The socks are a touch big on me but I’m hoping that a wash will solve that. 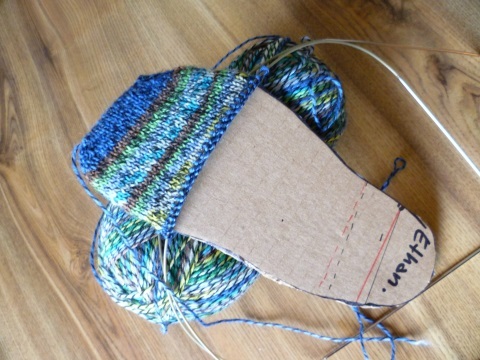 I know that the heel won’t shrink but I do hope it will at least tighten up the socks a bit. They are, however, nice and warm and cozy. 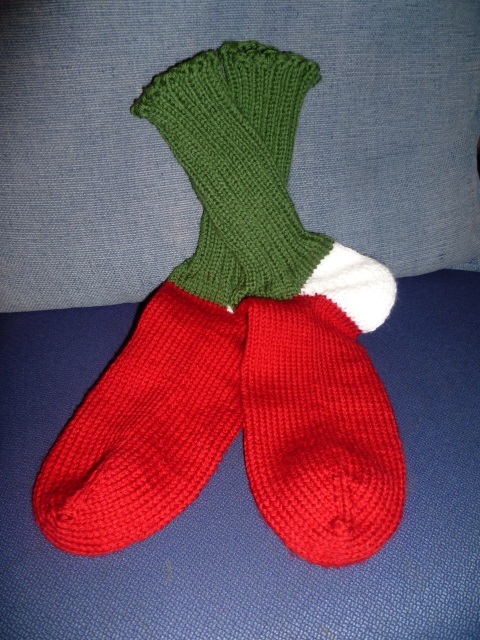 They’re meant to be worn around the house, in my slippers…. which need replacing soon. One of the main reasons I wanted to knit these (other than the practical reason of keeping my feet warm) was to test the Fish Lips Kiss pattern on adult sized socks. I’m very pleased with the result, even though they’re a bit large for me. Realistically, I should have used a smaller needle (I used 3.25 mm, I think); that would have made the knit a little tighter; and for next time, I know to make the foot portion a little shorter before starting the heel. Now, on with the day. There are letters to write, postcards to send out, dishes to be done, knitting to get to, a book to finish…. you get the idea. In spite of having a cold and feeling rather yuck, yesterday was a productive day. 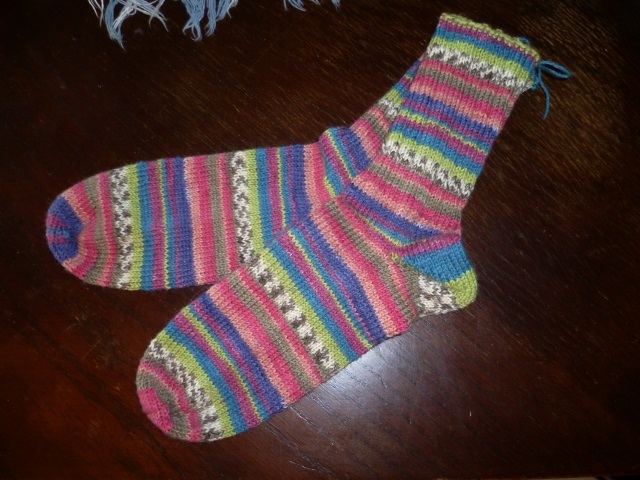 Trinity’s socks are finished and have gone home to live with her; she’s happy. 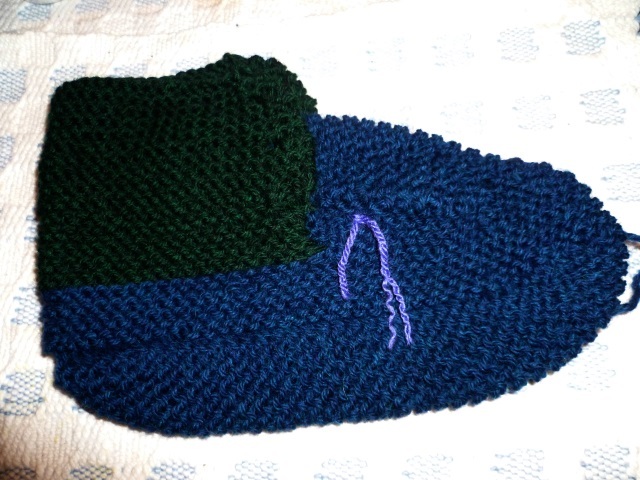 Ethan’s slippers have been worked on and, if I do say so myself, are looking pretty good. The colours work well together and, being a Bev Galeskas pattern, the knitting is going well. Bev’s patterns are well-written and, as long as you can read, are easy to follow. 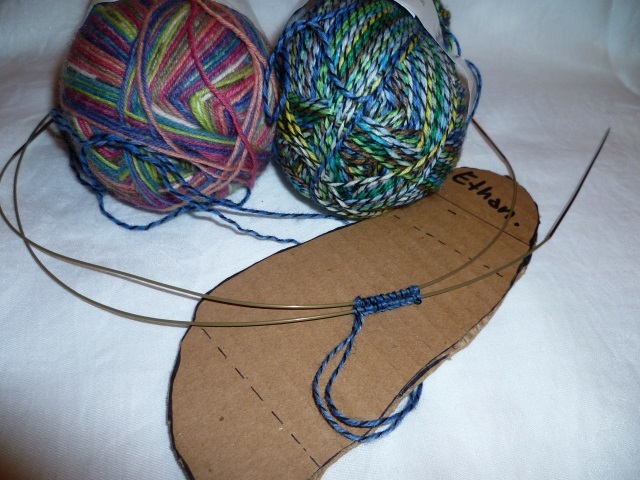 I’ll probably have one slipper done today and the second will be started. I don’t know how well you can see the needles in the picture but they’re square. I’ve never worked with square needles before. Here’s a close-up. They are (blast it, lost the packaging already! 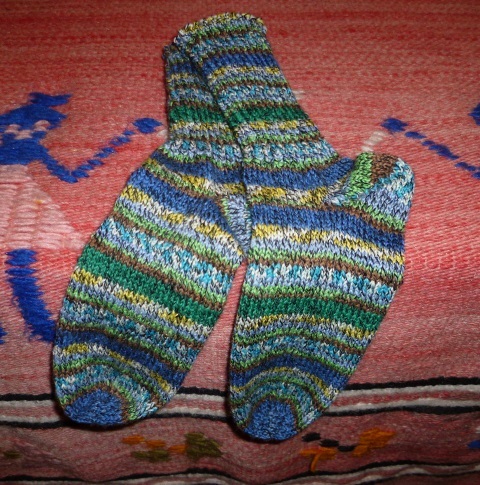 ), if I remember correctly, Knit Pro needles, size 6.5 mm. I’m still not sure whether I like them or not. The price was right and I needed them so I bought them and will use them for the slippers. Will I use them again? Time will tell. We’ve had company this week and Zelda brought me a gift… professional bread pans. She knows I like to bake bread. 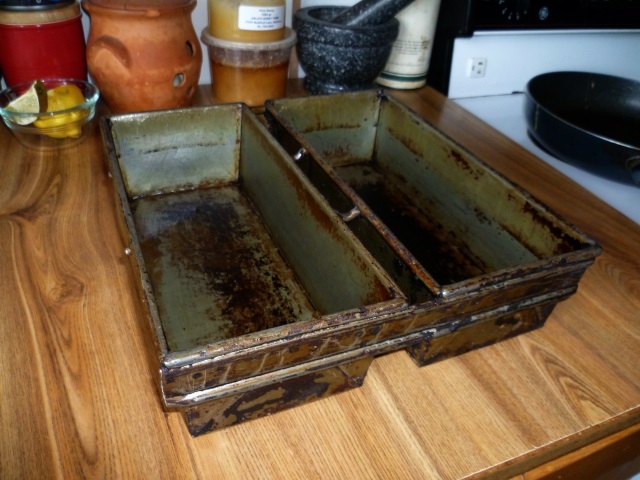 And when I say “professional”, I mean bakery bread pans professional… old. This is one half of a 4-loaf set and I absolutely love them! I had the time and desire to put them to use. That’s one batch of Halifax County White Bread. That’s the title in the book… why it’s Halifax County White, I don’t know; it’s nothing more than a basic white bread, really. I am more than happy with the results. The consensus around here, from Ethan on up, was that the bread is delicious and tastes like more! As soon as Ethan walked in the door, with the scent of freshly baked bread permeating everything, he complained about being hungry. I think he had four slices! As a thank you, I gave Zelda & Ian one of the loaves; there’s about a quarter of the other loaf left. 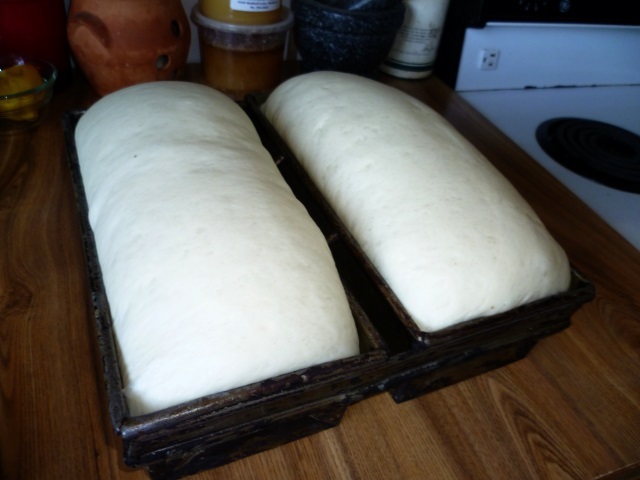 I’ll be baking another batch later today… for the freezer. 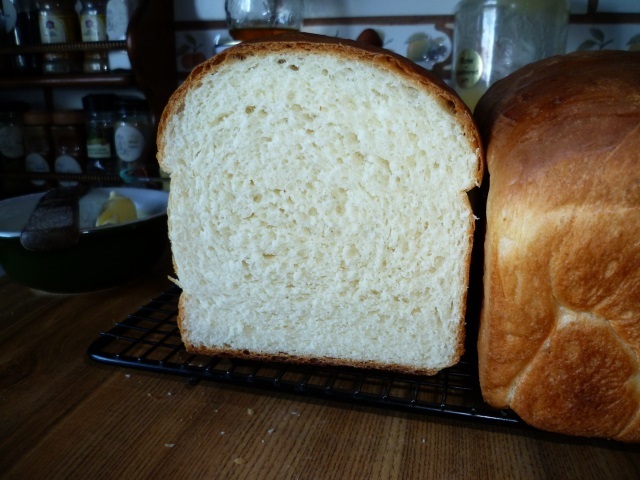 In case you’re interested, the recipe is from a little book I picked up years ago, “Great Bread Every Time” by Marilyn Barbe. As I recall, every recipe I’ve made from that book has been a success. I am finding, though, that I don’t need nearly the amount of flour that the recipes call for. That probably has to do with our elevation. 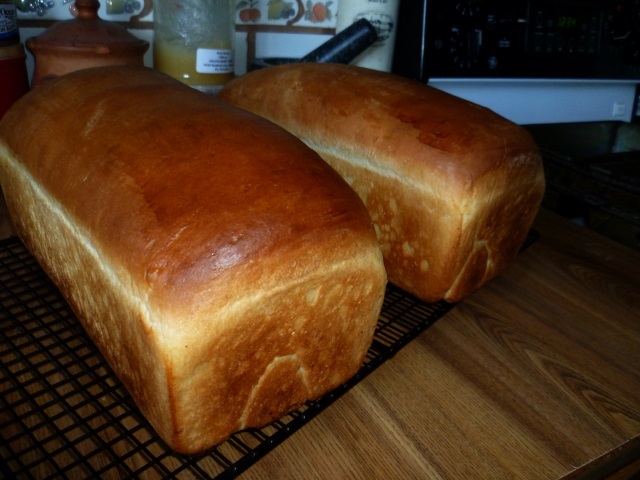 I’ve made enough bread in my life, though, to know when the texture is just right. For example, the above recipe called for 9-10 cups of flour; if I had used all of that, the bread would have come out as hard as a brick. I only needed 6-7 cups of flour to get the right consistency and elasticity required. After yesterday’s success on the bread-making front, I think it may be time to start a batch of sourdough bread again. Well, as of this morning, Trinity’s socks are done! Even though we’ve had company most of the week, I’ve been working on her socks every night; it’s only been a few rows while watching a TV show on the computer but it was progress. When I compared sock #2 to sock #1 this morning, I only had two more rounds to work and then the cast off. I think she’ll be happy. This was sock #1 after I gave Ethan’s his pair earlier this week. And this morning? Done! Off the needles. Packaged up and ready to give to Trin. Now, what next?? Ah yes, the slippers! It’s Tuesday morning; I should be getting ready for work. So why am I blogging?? Well, I’m just kind of excited about knitting these socks, that’s all. You’ll probably be sick of them before I’ve finished knitting them but… oh well. 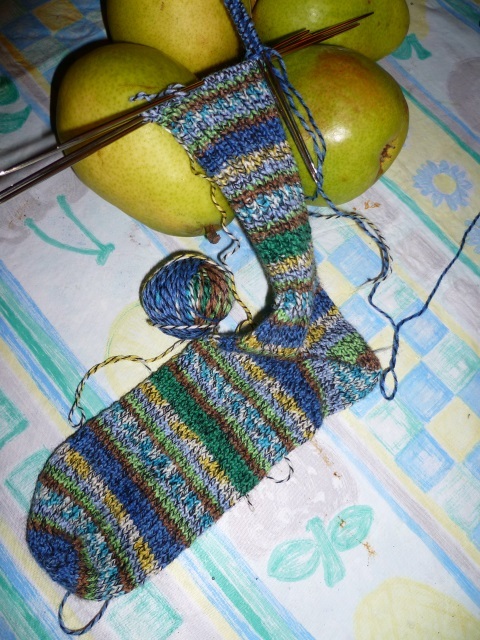 Ethan’s second sock is now ready for the heel, a little further along than in this picture. 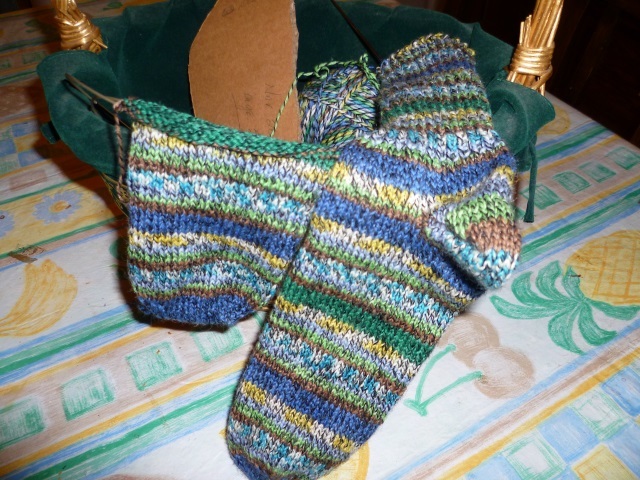 Since I still need to concentrate on what I’m doing with the heel, and it is not conducive to TV knitting, I decided to start on a pair of socks for Trinity. After John went to bed last night, I knew there was no way I could sleep yet, so I pulled out yarn and needles and cast on the toe of her sock. I thought about doing two at a time but let’s take this one step at a time. Besides, if I knit one sock from one end of the ball and the second sock from the other end of the ball, they’ll end up being completely opposite in pattern from each other. That would drive me (and probably her) crazy. And, at 10:00 p.m., I wasn’t about to pull out the digital scale and divide the yarn into two equal balls of yarn. That was simply beyond the scope of my capabilities at that time of night. 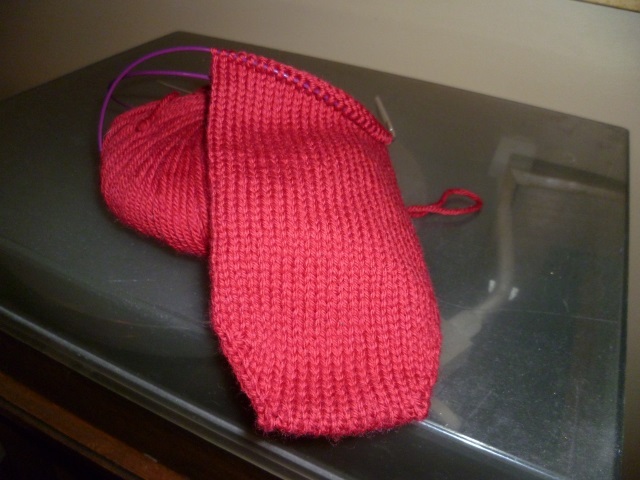 As of this morning, the toe is complete and I have some straight on TV knitting… until I get to the heel. It feels good to be back in the world of the knitting! Just a quick, short post today. Yesterday, being November 11, I spent the day indoors, working on the Fish Lips Kiss socks for Ethan (in addition to some laundry, dishes, and general tidying around here while John was at work). Progress was definitely made. All I need now is one of Ethan’s feet so I can see how it fits him. This was taken around lunch time, after I’d started and frogged the toe three or four times I wasn’t happy with how it was coming out. For this one, I used the toe pattern suggested by the Sox Therapist on her Ravelry page. For the cast on, I used Judy’s Magic Cast On, which I like quite well. As you can see, I’m knitting a very plain, “vanilla” pair this time, stocking stitch for the entire foot and knit/purl ribbing up the leg. I took this around dinner time, just after I’d finished the heel but not the one inch of stocking stitch above the heel. As of bedtime last night, I’d finished about 1/2″ of the ribbing (it’s difficult to knit ribbing while watching The Voice!). The foot was all done on two circulars but I’ve switched to double pointed needles for the leg. 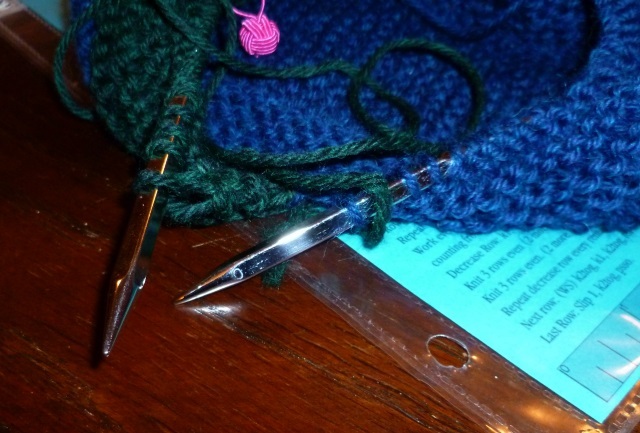 I’m simply more comfortable with dpns than with two circulars. The heel came together very quickly and looks pretty good, if I do say so myself and I LOVE that there is no gusset, no stitches to pick up, no wraps, none of the usual sock stuff. 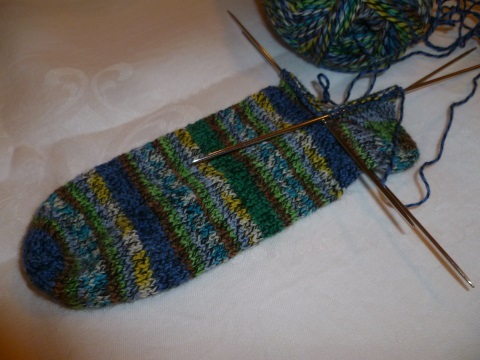 I will admit, though, that I’m leery about starting the second sock until I can see how this one fits Ethan’s foot. It fits the cardboard form perfectly so I should be okay but I’m sure you’d agree, I don’t want to do all the work just to have to frog two finished socks (or give them away). When this one is on his foot, I’ll be sure to take a picture. Then I’ll start the second sock. It feels like I’m “under the sea”, as the Disney song says. I’ve downloaded a pattern with the lovely title of Fish Lips Kiss Heel and I’m working with two circular needles; yes, I know an octopus has eight legs but knitting with two circulars feels a little like knitting with legs dangling all over the place. It’s easy to lose count.. four, eight… when it’s ends of needles, who can tell? This has become my very own personal challenge. I’ve been following the directions in the pattern/technique I wrote about on Sunday, the Fish Lips Kiss heel. 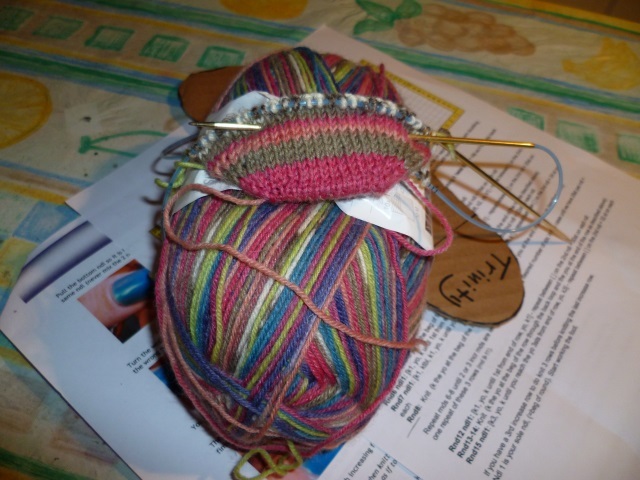 Thing is, you start at the toe and the directions are for the heel. 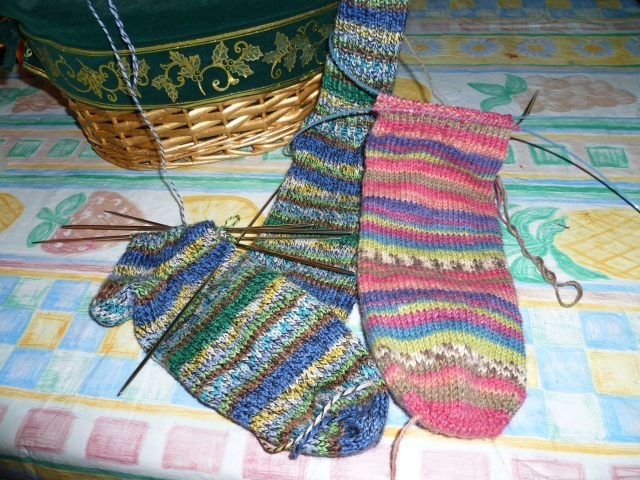 I’ve only ever made one pair of toe up socks and they are NOT my favourite socks, by any stretch. Patty-Joy has you make up cardboard templates for each person you want to knit socks for (as you can see, I’m starting with Ethan – he has the smallest feet in the family around me) and work from that template. 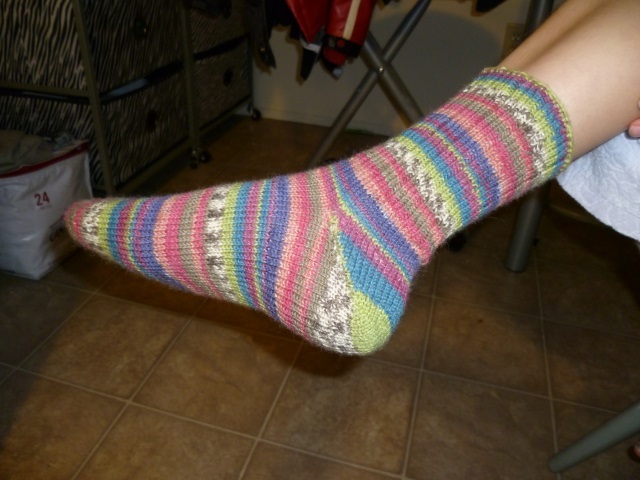 Last night, I had almost three inches of sock knit up but, when trying it on the template, it was on the big side. I’ll keep you informed as to how it all goes. Herein lies the reason for today’s post (incidentally, don’t expect a daily post – I just happen to be on a roll and remembering how much fun blogging can be). Those of you who knit socks from the toe up… do you have a favourite toe? A favourite cast on? The one pictured is Judy’s Magic Cast On (there’s a link to it on the “On The Web” page (up at the top right of this page), which I quite like. I’m just not that familiar with starting at the toe. Point me in the direction of your favourite toe pattern.